MANILA- While highly preventable with immunization, measles remains as a deadly disease, especially for very young children. The government last week declared a measles outbreak in several parts of the country following reports of several deaths due to the contagious disease. With rising concerns over the disease, a mother took to social media to inspire fellow parents of her baby's successful fight against the disease. Rose Ann Dumayas's daughter, Olivia, was only 9-months old when she contracted measles in September of last year, months before government declared a measles outbreak. "Naunahan kami ng sakit, while the measles is highly preventable kapag may bakuna, in our case, nagkaroon siya ng measles bago pa siya mabakunahan," Dumayas said in a Facebook post. Unvaccinated young children are at highest risk of measles, an airborne disease that infects the respiratory tract, and its complications which include severe diarrhea, pneumonia, blindness, and even death. Babies usually get the measles vaccine when they turn 9 months of age, however, doctors are now advising parents to have their children immunized even at 6 months of age due to the outbreak. Dumayas admitted that she did not know where Olivia got the disease and noted that fever was the first symptom they noticed on Sept. 27. 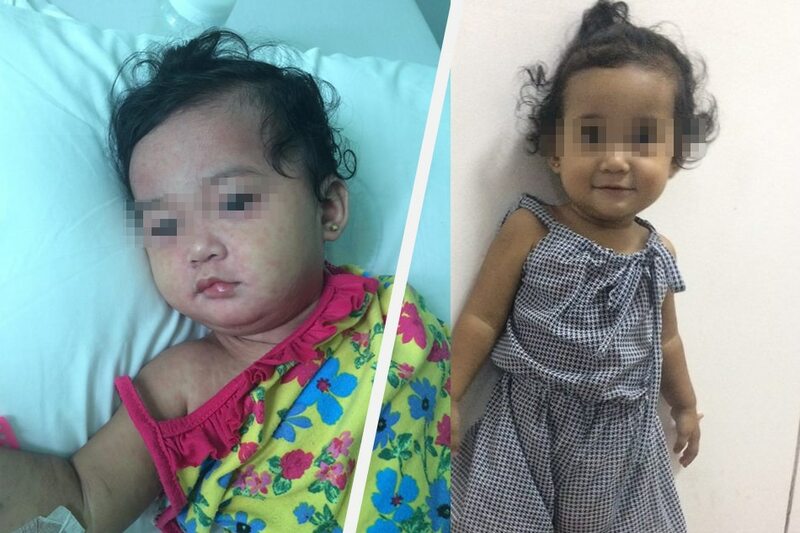 She said her daughter has a rare auto-immune disease known as Mastocytosis which causes the baby to have brown spots all over her body but Dumayas noted that Olivia's auto-immune disease was never triggered by a simple fever in the past. Two days later, Olivia's fever subsided only to return again, this time with colds and rashes. Dumayas said she decided to bring their baby to the hospital, thinking that Olivia might be sick with dengue since she had recurring fever and rashes. 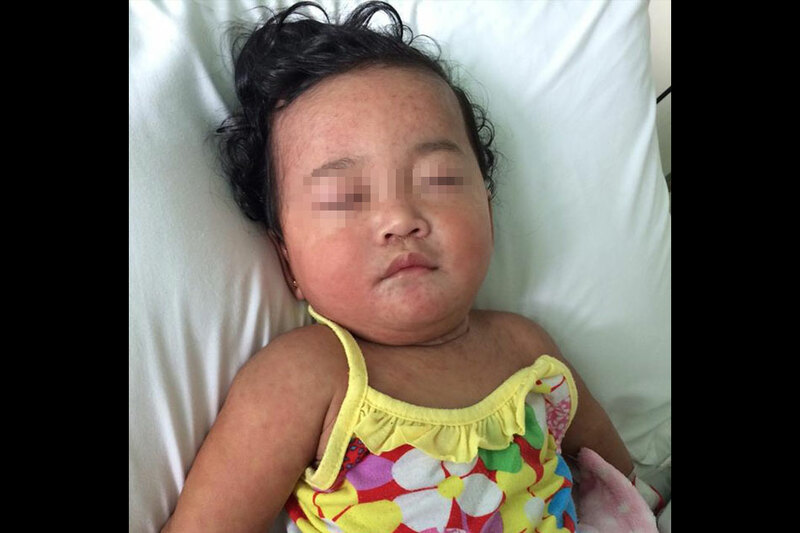 At the time, even Olivia's doctor did not suspect measles to be the culprit of the baby's condition, Dumayas said. "Mabilis ang progression ng sakit, from fever, cold and cough, bigla n lang siyang naging sobrang tamlay to the point na hindi na siya nagrerespond," she explained. Olivia had very red lips by Oct. 1 and refused to open her eyes, prompting her parents to rush her to the Bernardino General Hospital, Dumayas told ABS-CBN News. "Nilagyan sya ng oxygen kasi hndi na pala siya makahinga dahil puno na ng rashes ung loob ng bigbig at lalamunan niya," Dumayas said. Doctors then diagnosed Olivia with Pneumonia, a common complication from measles. Following the diagnosis, Dumayas said her daughter suddenly got very high fever and had poor appetite. It would take two more days before Dumayas would figure out that her daughter contracted measles. "Olivia is battling pnuemonia and measles. Mataas pa din fever niya and madalas syang magnebulize. This time lumabas na yung lahat ng measles rashes nya," she said. On Oct. 4, Dumayas said she thought her baby's condition was already improving since Olivia's fever subsided but she was covered in rashes. But in the next two days, Olivia's body and eyes would swell up, an effect of measles. "It is only God who can extend the life of our daughter. We are really helpless, hindi namin alam kung anong mangyayari. But we fight, we always tell to her that it's gonna be okay. Kapag gising siya, pinapakita namin na masaya kami then kapag tulog sya, umiiyak kami kay Lord to heal her," Dumayas said. It would take three more days for Olivia's swelling to go down and for her measles rashes to subside, Dumayas said. Olivia soon recovered from measles and has since turned 1-year old. "One year old siya nung nagpavaccine for MMR (measles, mumps, and rubella). Now she’s 14 months na," Dumayas said, noting that her daughter is now "perfectly fine." For those with babies, Dumayas urged them to immediately have their children vaccinated against measles. "Be always updated sa vaccine, limit hangga't maari ang contact with people, find a trusted pedia," Dumayas said. She also advised parents to remain wary of their children's health condition and be alert on any possible physical and behavioral changes. "Most importantly, partner with God in taking care of the children that we always have to pray for them (kids)," she said. You haven’t had measles your whole life. Should you be worried?